Full colour A2 poster summarising, slips, trips, computer operator safety, accidents, manual handling, fire safety. 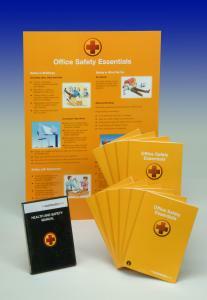 The Office Safety Essentials Booklet is a low cost way of providing essential and concise Health & Safety information to help meet the training needs of office staff. Accepted by The Royal Institute of Public Health (RIPH) as suitable for awareness level Health & Safety training for staff working in an office environment.